Something strange was hiding in the Horsehead. The nebula, named for its stallionlike silhouette, is a towering cloud of dust and gas 1,500 light-years from Earth where new stars are continually born. It is one of the most recognizable celestial objects, and scientists have studied it intensely. But in 2011 astronomers from the Institute of Millimeter Radioastronomy (IRAM) and elsewhere probed it again. With IRAM’s 30-meter telescope in the Spanish Sierra Nevada, they homed in on two portions of the horse’s mane in radio light. They weren’t interested in taking more pictures of the Horsehead; instead, they were after spectra—readings of the light broken down into their constituent wavelengths, which reveal the chemical makeup of the nebula. Displayed on screen, the data looked like blips on a heart monitor; each wiggle indicated that some molecule in the nebula had emitted light of a particular wavelength. Every molecule in the universe makes its own characteristic wiggles based on the orientation of the protons, neutrons and electrons within it. Most of the wiggles in the Horsehead data were easily attributable to common chemicals such as carbon monoxide, formaldehyde and neutral carbon. But there was also a small, unidentified line at 89.957 gigahertz. This was a mystery—a molecule completely unknown to science. Immediately after seeing the data Evelyne Roueff of Paris Observatory and other chemists on the team started theorizing about what kind of molecule might create the signal. They concluded that the unknown species had to be a linear molecule—a compound whose atoms are arrayed in a straight chain. Only a certain type of linear molecule would produce the spectral pattern the chemists were seeing. After working through lists of likely molecules, they hit on C3H+, propynylidynium. This molecular ion had never been seen before. In fact there was no proof it existed at all. If it could form, it would be highly unstable. On Earth it would almost immediately react with something else to transform into a more settled species. But in space, where the pressure is low and molecules rarely run into anything else to bond with, C3H+ might just be able to survive. IN 1968 ASTRONOMERS DISCOVERED AMMONIA IN THE SAGITTARIUS B2 CLOUD. These space molecules, once identified, could teach us a lot. Some of them might prove beneficial if scientists can create them in laboratories and learn to exploit their properties. Other molecules may help explain the origins of the organic compounds that gave rise to life on Earth. And all of them stand to expand the bounds of what is possible for chemistry in the universe. In the past decade, as powerful new telescopes capable of observing faint spectral lines have come online, the search for alien molecules has accelerated. “It’s actually a heyday for astrochemistry right now,” says Susanna Widicus Weaver who leads an astrochemistry group at Emory University. The data available now, she says, are a huge improvement from just a decade ago when she completed her doctorate. NASA’s high-altitude Stratospheric Observatory for Infrared Astronomy (SOFIA), mounted on the side of a Boeing 747SP, began observing in infrared and microwave light in 2010 and the European Space Agency’s Herschel Space Observatory launched into orbit in 2009 to target the same wavelengths. 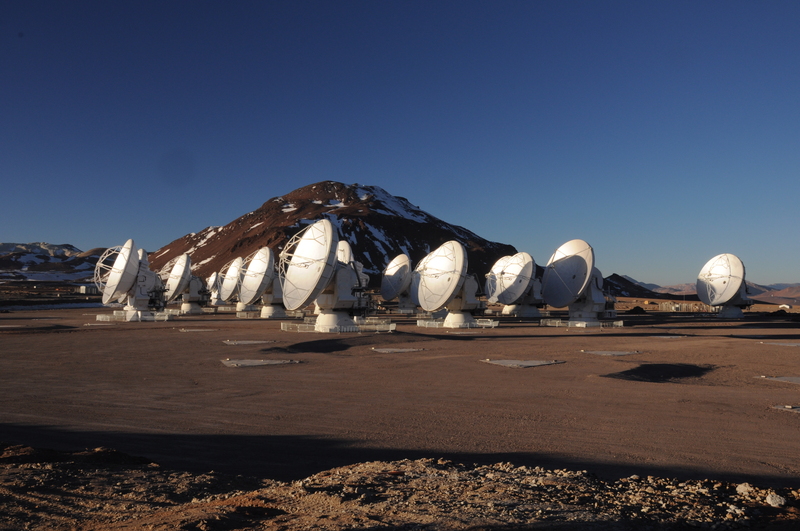 THE ATACAMA LARGE MILLIMETER/SUBMILLIMETER ARRAY (ALMA) IN CHILE. The real game-changer, however, is the multinational Atacama Large Millimeter/submillimeter Array (ALMA), a constellation of 66 radio dishes inaugurated in 2013. At an altitude of about 5,200 meters on the Chajnantor Plateau, a Mars-like red expanse in Chile’s Atacama Desert, the driest place in the world, ALMA’s matching antennas swivel in unison as observers collect light from cosmic objects. Extremely dark and clear skies nearly devoid of image-blurring moisture give the telescope unprecedented sensitivity and precision in wavelengths from infrared to radio. ALMA creates both a visual picture and a spectrum for every pixel of its images, producing tens of thousands of spectral lines in every field of view it observes. “It’s amazing and it’s overwhelming at the same time,” Widicus Weaver says. “These data sets are so big that they often have to mail them to scientists on flash drives because they can’t download them.” The flood of data is providing a wealth of new spectral lines for astrochemists to mine. But like unidentified fingerprints at a crime scene, these lines are useless to scientists unless they can determine which molecules created them. THE TAURUS MOLECULAR CLOUD AS SEEN BY THE APEX (ATACAMA PATHFINDER EXPERIMENT) TELESCOPE IN CHILE. And in the 1980s scientists trying to make new chemicals produced the molecule argonium (36ArH+), a strange compound not normally found on Earth that combines hydrogen with the generally inert gas argon. In 2013 astronomers found argonium in space, first in the Crab Nebula and later in a distant galaxy via ALMA observations. 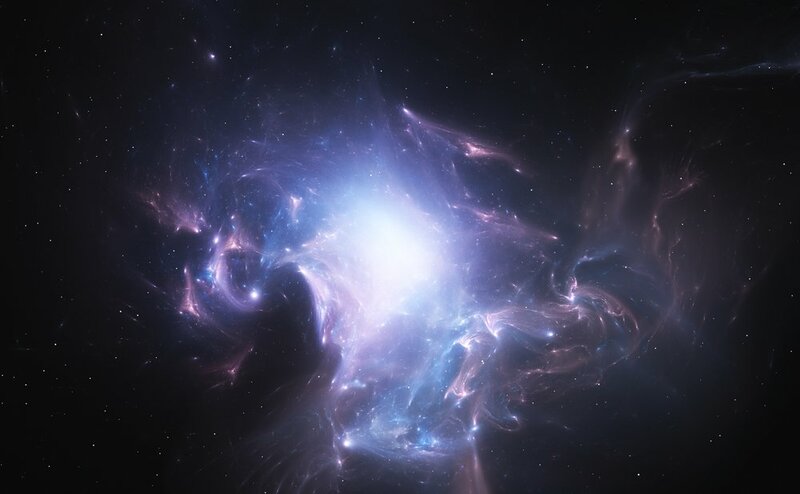 Compounds based on noble gases form only under very specific circumstances; scientists think that in space, high-energy charged particles called cosmic rays slam into argon and knock electrons loose, enabling it to bond with hydrogen. For this reason, if scientists see argonium in a region of space, they can surmise that the place is flooded with cosmic rays. “It’s a very specific indictor of these circumstances which actually are very important in space,” says Holger Müller of the University of Cologne, leader of the team behind the ALMA discovery. Many of the molecules lurking in stars and nebulae are foreign in the extreme. To ask what they would look or feel like if you could hold them in your hand is nonsensical, because you could never hold them—they would react immediately. If you did manage to make contact with them, they would almost certainly prove toxic and carcinogenic. Oddly, however, scientists have a rough idea of what some alien molecules would smell like: Many detected so far belong to a class of compounds called aromatics, which are derived from benzene (C6H6) and were originally named for their strong odors. And space molecules may help answer one of the universe’s most fundamental questions: How did life get started? Scientists do not know if amino acids, the building blocks of life, first arose on Earth or in space (and were then delivered to our planet by comets and meteorites). “The big question is, do they form in molecular clouds as a star is forming,” asks Widicus Weaver, “or do they form once you have a planet or some other chunk of rock where chemistry can occur on the surface?” The answer will determine whether it is likely that amino acids are plentiful in the universe and available to possibly seed life on the myriad exoplanets out there or whether the chemistry that sparked us was isolated to our own planetary cradle. Astrochemists have already spotted signs of amino acids in space as well as sequences of molecules that might have given rise to them. BUCKYBALLS, CONGLOMERATIONS OF 60 CARBON ATOMS, WERE FIRST CREATED IN LABS ON EARTH AND LATER DISCOVERED IN SPACE. Finally, perhaps some rare species could prove useful if they can be created in great enough quantity and kept under controlled conditions. “The great hope of astrochemistry is that we can find molecules that have completely new properties and we can apply those to problems here on Earth,” Fortenberry says. An example is the soccer ball–shaped molecules “buckyballs.” These large conglomerations of 60 carbon atoms first showed up in a laboratory in 1985 (and won their discoverers a Nobel Prize). Almost a decade later astronomers saw spectral features in interstellar gas that looked consistent with positively charged versions of buckyballs, and the connection was confirmed this July when researchers matched those features to the spectrum of buckyballs created under spacelike conditions in the lab. “This molecule is now all over the galaxy and all over the universe,” says buckyball co-discoverer Harold Kroto, now a chemistry professor at The Florida State University. Lately buckyballs have turned out to be not just a quirk found in space but a practical tool for nanotechnology, useful for strengthening materials, improving solar cells and even in pharmaceuticals. At this point astrochemists are still testing the shallow waters in the great sea of molecules out there in space. The finds they have already turned up are a reminder that our own small corner of the cosmos is just that—an insignificant, and not necessarily representative, sample of what is possible. Perhaps the species we are familiar with on Earth are in fact the exotic ones, and the buckyballs, the Horsehead Nebula C3H+ and others still unknown are the ordinary stuff of the universe.